So I was wandering the intoxicating halls of Pinterest the other day and came upon the neat project of sewing giant floor pillows. 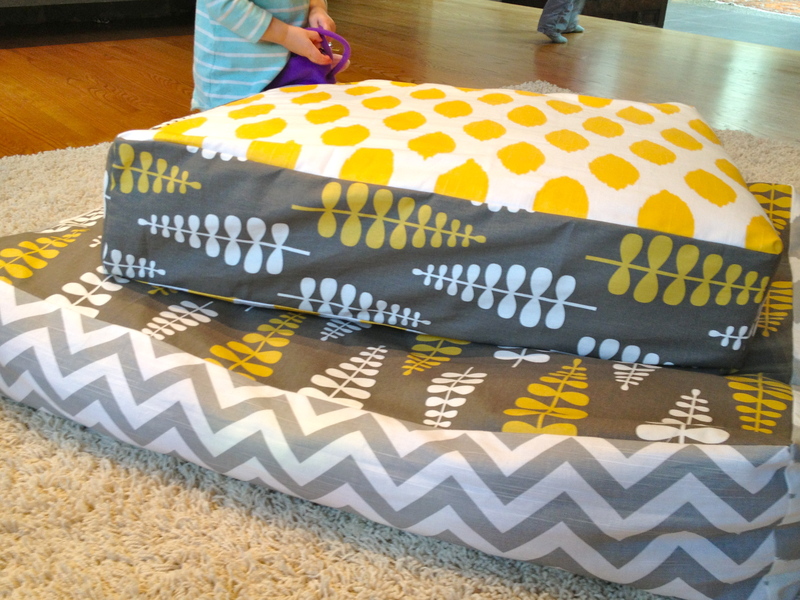 Since my children adore all things associated with forts and pillows, this seemed right up our alley! I am envisioning using these goodies for cozy movie nights, pig piles and all things requiring a bit of cushioning… The awesomely graphic fabrics make them even better! The directions and inspiration are found on Mandy Made’s creative blog and I’m sure you will find all sorts of other things you want to make once you take a stroll through her pages! I loved the idea of how simple this project looked and couldn’t wait to begin. I happened to have some home decor weight canvas hanging about, just waiting for the right project! As I began this project, I felt like Mandy’s directions were very good and nicely simple. 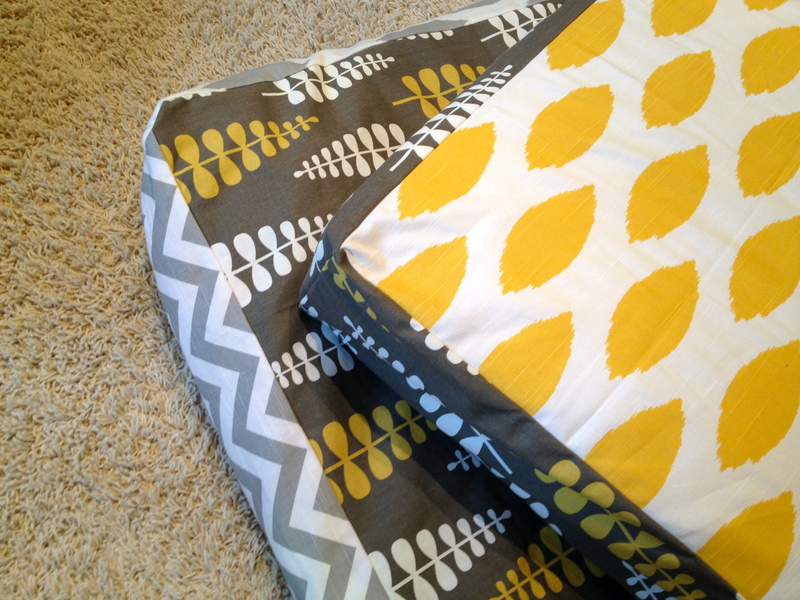 I had a little trouble getting the corners just right, but I still think the pillows turned out well. 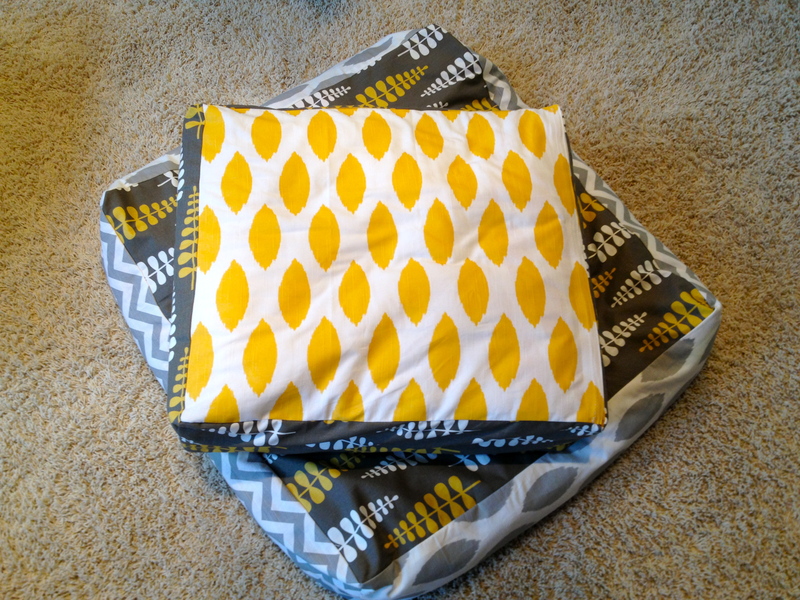 I made two giant cushions; one following Mandy’s plan of using scraps to fill the pillow (#1, grey with white sides) and one with a little more structure using a foam rectangle covered in batting (#2, yellow with grey sides). If I make more (which I will, since I have three children and currently two coveted pillows), I will follow the second strategy. I like that pillow #2 ended up a lighter in weight and more reliably full. We’ll see if I end up remaking pillow #1, or leave it as is. I also worked on a different closing method on pillow #2, as I realized that it would be nice to to wash the exterior case. In a house with three kids and a dog who has a penchant for all things soft (and a tendency to shed), these will need to be washed periodically! I ended up using an iron-on velcro closure, which worked like a charm! The best part about these pillows is I had barely finished closing pillow #2 before the cushions were being put to use in a serious play session! The kids could not keep off of them, as evidenced by these photos (below). I could barely take a picture before the pig piles began! A true sign of success! Anyway I could get to this tutorial? I’ve seen it links in multiple blogs but the actual blog is blocked. Any help would be appreciated :)! Hello ~ What a bummer! Thanks so much for bringing this to my attention, as I had no idea the tutorial had been removed. I’ll have to look around to see if I printed any of the info out, but sadly I think I just used it online. Good luck!